Event triggered campaigns are configured on the deltaDNA platform from the “ENGAGE > In GAME > Event Triggered Campaigns” menu and support player segmentation, A/B Testing and the ability to target campaign content based on sophisticated event and parameter combinations. From a developer perspective they are easy to implement as the SDK takes care of all the configuration and caching. The game will already be recording the events required to trigger the campaigns, so a slight tweak to your event recording call and a couple of callback handlers to take care of content returned by the campaign, is all that is required. Record an event and hook up the campaign callback handlers. //Register default handlers for event triggered campaigns. These will be candidates for handling ANY Event-Triggered Campaigns. //Any handlers added to RecordEvent() calls with the .Add method will be evaluated before these default handlers. // Add a handler for the 'dismiss' action. // Add a handler for the 'action' action. The SDK will automatically record two events so you can report and analyse the success of Event Triggered Campaigns and AB Tests. Make sure the following events are present in your event schema, if not, they can be added from the event template list when you add a new event to your DEV environment. imageMessageAction is recorded each time the player clicks on an Image Message to perform and action or dismiss it. 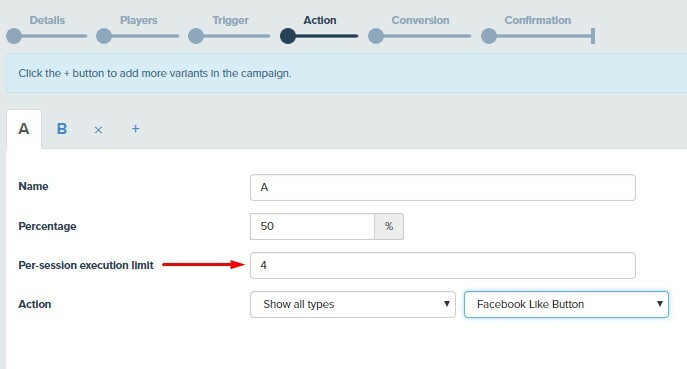 By default, event triggered campaigns only fire one Game Parameter action from the highest priority campaign in response to a matching event trigger. However, It is possible to override this behavior and fire responses from multiple matching event triggered campaigns on a single trigger. A use case for this might be if you want to A/B test a variety of different settings groups by setting multiple campaigns to fire on the gameStarted event. Perhaps one testing starting currency variants and another testing difficulty settings and progression. Simply setting up two Campaigns as AB tests with the same event trigger criteria and configuring the SDK to react to multiple triggers will make this possible. Your Game Parameter handler routine will essentially be fired multiple times, once for each campaign action. Only the highest priority Image Message action will be displayed should multiple campaigns contain image message actions. This functionality is for Game Parameter actions. Event Triggered campaign logic and content is downloaded at the start of each session, so if you make changes to your campaigns, they won’t be picked up by the SDK until it’s next session. There are two controls that determine how frequently the player sees content from a campaign in a single session and whether it is displayed in further sessions. The “Per-session execution limit” control on the “Action” tab of the “Event Triggered Campaigns” setup tool controls the number of times an action will be shown to the player within a session, presuming they record the triggering event multiple times. The “Send content on every Engage request” checkboxes, that are present on every image message and game parameter, inside the Action setup tool, determine whether the campaign action will be available on subsequent sessions. If they are not checked the content will only be shown on one session, if checked it can be shown on multiple sessions. NB : Image messages and game parameters all have their own individual checkboxes for this, so you can setup campaigns that deliver the same game parameters each time the triggering event is called but only show the image once. Please refer to the Event Triggered Campaigns documentation for more information on setting up these campaigns on the platform.